Have you ever wondered of the difference between "semi-auto" and "full-auto"? Unsure of what a "machine gun" actually is, but didn't want to ask? If one trigger pull releases only one bullet, it's semi-automatic. If one trigger pull allows for multiple rounds, it's fully-automatic. Let's talk a bit about how this works mechanically. Since revolvers work differently, we will save their function for a future article. This video is my favorite amongst the many that exist. It not only shows the function, but provides an explanation for each movement. What you'll notice is that from the time the slide is initially retracted manually to load the first round, energy is captured from each step and used to fuel each subsequent step in the firing cycle. It's incredible to think about. So when thinking semi-automatic, think: trigger pull, primer of the round is struck, tiny explosion inside the chamber propels the bullet forward, recoil pushes the slide back, empty case is ejected, and the combination of the slide readying to move forward with the upward push of the magazine's spring loading another round to fire with the next trigger pull. Pretty straightforward. Now, let's talk about fully-automatic firearms. Most full-autos are capable of firing in multiple modes (not including the safety being on, preventing the firing of the weapon): single, burst, and the fun-switch. Check out this video demonstration of fully-automatic firing. It provides insight into how a combination of simple machinery is used to efficiently capture energy and direct it into the next step, much like how a semi-automatic is fired. It has been said that it is a "bullet driven engine". There are many platforms and variations of which this energy is captured and redirected to continue the feed and firing of bullets. They are blowback action, recoil operated action, and gas operated. So when you hear "machine gun", think fully-automatic firing. The same principals guiding the operation of semi-automatic firearms are used here, but with the addition of a few parts allows the firing mechanisms to operate without additional trigger pulls. While semi-automatic weapons are readily available, full-autos/machine guns are extraordinarily difficult for the average person to legally acquire. After applying to do so and undergoing extensive interviewing and background checks from the local level to national level, there is a six to nine month waiting period. Also, fully automatic weapons are significantly more expensive. It is not uncommon to pay more than $10,000 for a single firearm. 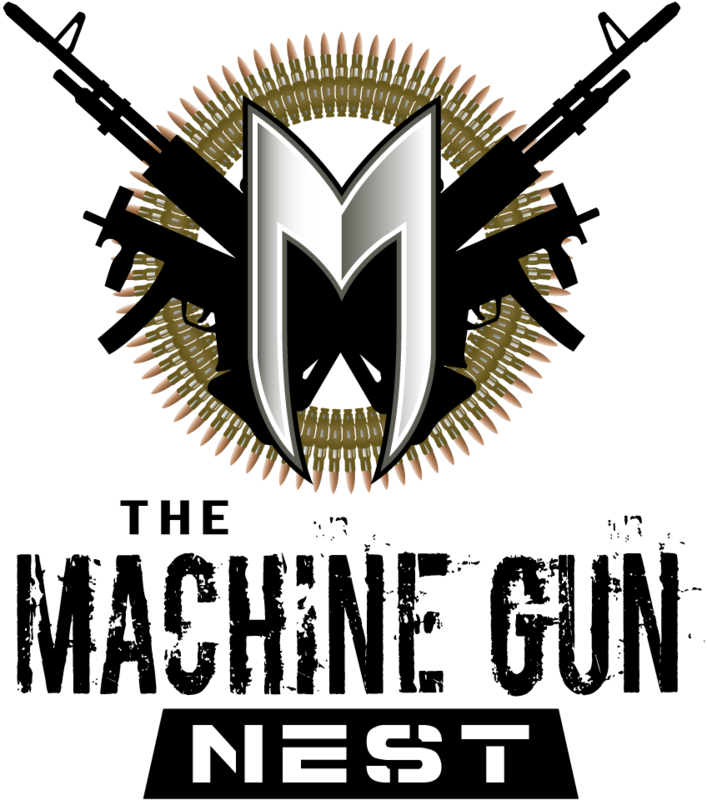 Here at The Machine Gun Nest, you can experience these incredible pieces of history and technology in a controlled, safe environment. Our selection of full-auto inventory is quite large, and still growing! Each machine gun rental includes a full safety briefing where you will be acquainted with the firearm's safe operation and even a bit of history. The Range Safety Officer (RSO) will accompany you to the firing line where you will first fire a few bursts before unleashing the full potential of lead flying downrange at incredible rates. It is an exhilarating bucket-list experience! The RSO will ensure that it is clear and safely transport it back to our shelf. After, you receive a free t-shirt in addition to an experience you won't forget.